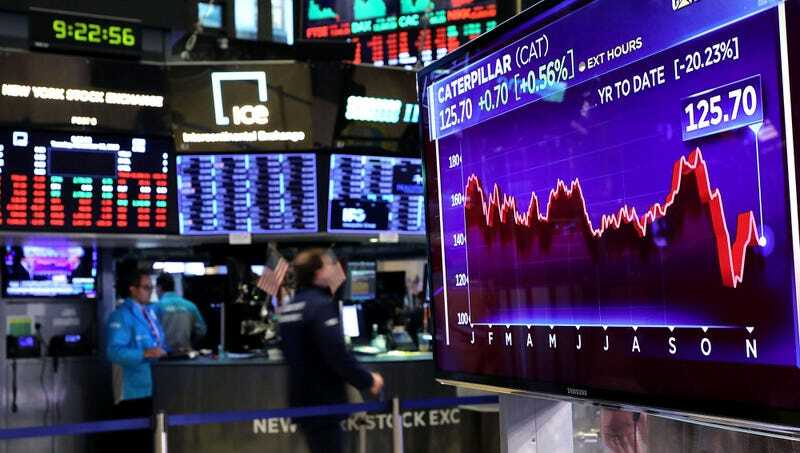 NEW YORK—Reminding investors that 800-point swings are completely normal, financial experts confirmed Thursday that the stock market constantly plunging before climbing to record highs was the leading indicator of a healthy economy. “A highly volatile market that reaches a record high one day before suddenly wiping out weeks’ worth of gains the next is a defining characteristic of a robust economy,” said Standard & Poor’s chief global economist, Paul Gruenwald, who urged investors to remain calm and continue buying up stocks before dumping everything the instant the Dow dropped. “We’re right in the middle of what we call an Everest/Mariana Trench pattern, and that’s exactly the kind of wild oscillation you want to see across all markets. Investors everywhere should consider this an opportunity to either make or lose a huge sum of money.” At press time, financial experts were beginning to panic after trade talks between America and China caused the market to briefly stabilize.